decision-making is not in my nature. | escaped. decision-making is not in my nature. In three days, I'll have to decide on which lab I'm going to pursue my final year in. Emphasizing on which course of chemical engineering I'm going to specify into, which means which field of engineering I'm (most likely) going to work in. This is truly a middle age crisis, and I'm not even 25 yet. I don't want to blindly choose the lab everyone goes; or the lab that has the most popularity; or the lab that has the cute senpais; or the lab that has the kindest sensei. Because I know sooner or later I'm going to regret that. But I don't know which one I'm supposed to set my target to. Heck, I don't even know which subject I'm good in. How did these people do this??!! Pfft. At the moment I do have certain labs I've set my eyes on, but I don't really know the reason. It can be because the senseis are kind or it's the one everyone's not going to go so it has the less competition..I don't know. I have three days to figure this out..THREE days and I'm going to decide on something that'll change my whole final year. 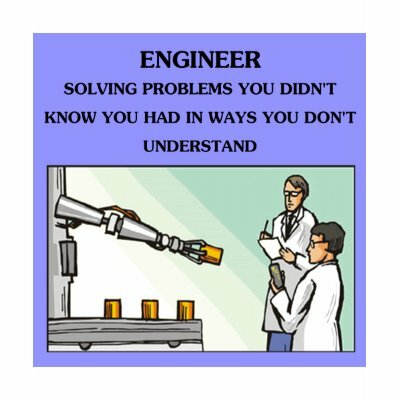 You know, being an engineer is not that easy. 1. The world does not revolve around us. We choose the coordinate system. 2. No "couple" could enjoy a better "moment." 3. We know how to handle stress and strain in a relationship. 4. We have significant figures. 5. EK 301: The motion of rigid bodies. 6. Projectile motion: Need we say more? 7. Engineers do it to specifications. 8. According to Newton, if two bodies interact, the forces are equal and opposite. 9. We know it's not the length of the vector that counts, but how you apply the force. 10. We know the right hand rule. 3. Since distance equals velocity times time, let's let velocity and time approach infinity, because I want to go all the way with you. 6. Wanna come back to my room?... and see my 300mHz Pentium II? 9. You're sweeter than fructose. 12. Wanna see the programs in my HP? 14. You're hotter than a bunsen burner set to full power! 15. I'd like to browse through your clothes like I browse through Netscape. 16. Hey baby, let's make a stress-strain curve together. "Engineers aren't boring people, we just get excited over boring things." dear,i dont knoe y i tetba masuk bidang ni.kalau hg lain la,heheh,sy yg pemls dan x rajin ni mcm mana boleh masuk cni nih..
life bcome more harder day by day. 3 words 4 u,i love u.
hahah gotta agree on that.lifes becoming harder day by day.engineering life,that is. haha, ur pick up lines made me wanna post doc's pickup line.and i did! on tumblr! lol. hey, nothing good comes easy! haha..me pon cari pharmacy pick up lines...and its on facebook..haha! regarding your choice which one nak major in, hmm...if i were you, i'd go for what im interested in..huhu...even me myself pon x minat sgt pharmacy (especially clinical) but pena has a point there..whatever we choose, maybe it's fated to be..=) so, good luck! yeke? ?tak jumpe pun engineer punye.haha.